This week has gone very quickly and here we are again at Friday and it’s The Weekly Adoption Shout Out. Plenty of people joined in again last week and we had some great posts. 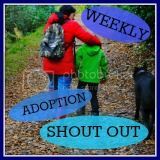 Remember if you know someone else who blogs about adoption to let them know about #WASO and invite them to join in. It’s good to have new blogs to read as well as all our wonderful regulars. The theme this week is “The Early Days” and we look forward to reading your interpretations of this. It’s interesting the way the themes are often perceived differently by you all, providing lots of diverse reading. There is no need to write about the theme, it will always be optional, you can link up any posts your written this week. The link up is on both The Puffin Diaries and The Boys Behaviour, you need only add your post on one of these sites but it will still appear on both. Please come and visit our Facebook page where we are sharing your posts and other WASO snippets so please hop over and LIKE us and join in. It would be great if you could visit some of the other blogs that link up and please let them know who you are, and how you found them, you can even share your favourites on twitter or tweet your own post with the hashtag #WASO, we will try and share as many as possible too.